Whatever your budget, there is accommodation in and around Kinloch Rannoch to suit every pocket. Accommodation ranges from the more expensive hotels and guest houses to campsites, holiday lodges and caravan parks. The pretty village of Kinloch Rannoch lies on the tip of Loch Rannoch. With Kinloch Rannoch at the eastern edge of the loch, Loch Rannoch stretches ten miles west to the Bridge of Gaur. The name of Kinloch Rannoch comes from the Gaelic term of 'Ceann Loch' meaning 'end of the loch'. With this, Kinloch Rannoch benefits from beautiful loch-side views as well as the stunning Perthshire countryside and highlands. Kinloch Rannoch is a popular place to visit thanks to its picture-postcard views. 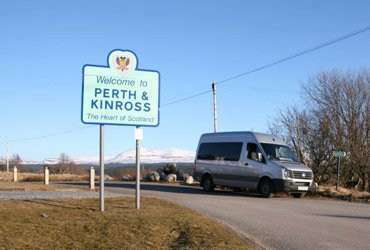 The area is ideal for tourists as it hosts many activities which makes the most of the great outdoors in all types of Kinloch Rannoch weather. In the heart of Perthshire, between significant settlements of Perth and Kinross, it is easily accessible. The village provides peace and tranquillity while benefiting from the large towns just a short drive away. Thanks to its incredible natural beauty, Kinloch Rannoch is the perfect place to explore. The village is an excellent starting point for the 22-mile circular cycle route around the loch. Elsewhere in the village is part of the Clan Trail. Visitors can join this walk in the beautiful scenery and be taken back in time with interesting clan tales and adventures that have taken place in the same spot. There are breath-taking views almost everywhere you turn in Kinloch Rannoch. From the gentle ebb of the loch to that woodland trails that take you through the Rannoch forest. Head to the highlands, and you can explore the wildness of the Great Moor of Rannoch, the ideal place for getting back to nature. Whether you want to unwind or feel invigorated, Kinloch Rannoch has the activity for you, whatever the Kinloch Rannoch weather. Just make sure to bring a camera to capture the beautiful views and hopefully spot some of the best of the Scottish wildlife too. Enjoy a rangeÂ of excellent places to eat in Kinloch Rannoch with good use of local ingredients. 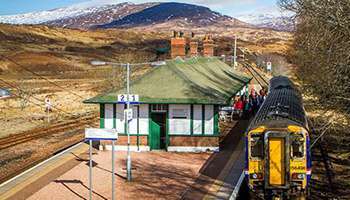 Located approximately 18 miles from the village of Kinloch Rannoch, Rannoch Station is one of the most remote railway stations in the British Isles. Designed by James Miller, it is on the famous West Highland Line which links Glasgow on the Firth of Clyde, to Mallaig on the west coast, via Fort William, and runs across the remote wilderness of Rannoch Moor. The station building itself sits on a small island between the â€œupâ€� line and the â€œdownâ€� line. 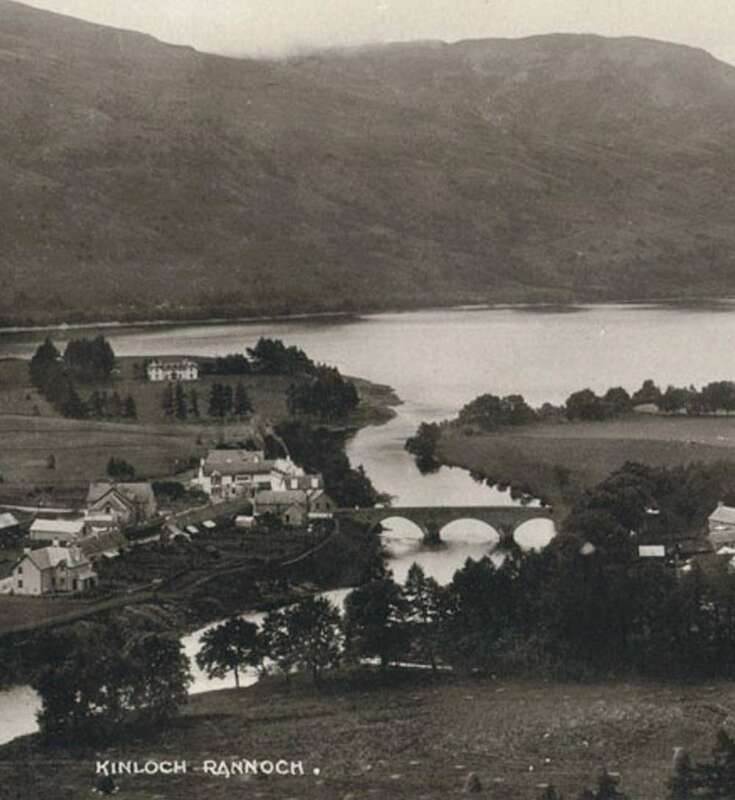 There is evidence of settlement in the area surrounding Kinloch Rannoch from as far back as 500AD when the missionary St. Blane arrived although the name remains a mystery, as the word â€œkinlochâ€� means head of a loch, rather than the foot, where the village is located. For many hundreds of years, this tiny and remote hamlet was home to a few primitive people who lived a poverty-stricken existence, surviving mainly by thieving and, for a long time, there were no roads or bridges in the area. We will carefully pack up your selection in a chilled poly box, to ensure that everything reaches you in a perfect condition. We will not charge you more for a fancy basket as we think it is better value for money if you spend on the products you want, not on the packaging. If your selection is a gift for someone else, please feel free to add a gift message to your order and we will include a card with your message in your hamper. Enjoy your shop. This pretty village sits at the eastern end of Loch Rannoch in Highland Perthshire, on the banks of the River Tummel. Kinloch Rannoch or Ceann Loch Raineach in Gaelic, meaning â€˜head of the lochâ€™ ironically lies at the foot of Loch Rannoch. Rannoch Station, marks the end of the end of the road through Rannoch Moor, however traditionally the â€˜Road to the Islesâ€™ also came east from Fort William, via Lochaber, Glen Coe, across Rannoch Moor, past Loch Rannoch and Loch Tummel and through to Pitlochry. Today, Kinloch Rannoch is a hub for tourism, farming and forestry. There is a wealth of accommodation within the village and surrounding area, complementing all tastes. The residents of Kinloch Rannoch are as friendly and welcoming as the picturesque scenery surrounding them. Situated in the shadow of Schiehallion (a munro and an excellent climb), Kinloch Rannoch boast some lovely walks: Carie Forest, along the South Loch Road; along the waterfall that feeds into the River Tummel and up Craig Varr; the Sleeping Giant or alongside Loch Rannoch itself.